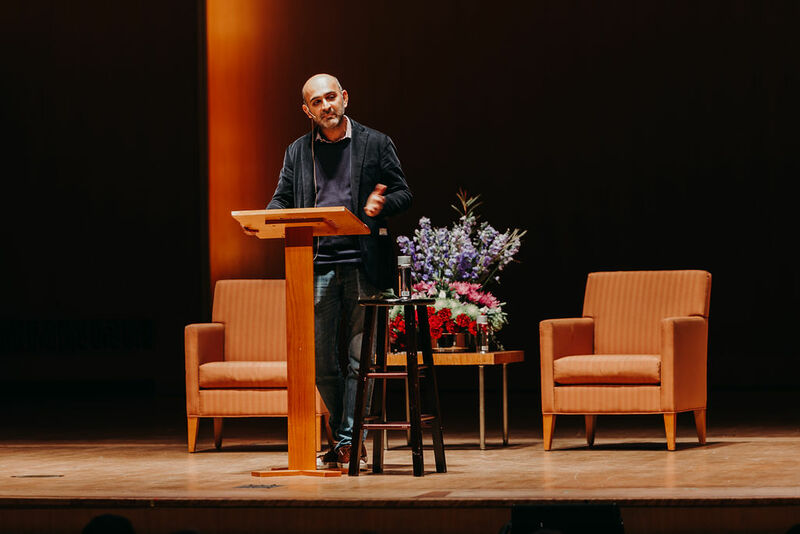 On October 3rd, Just Buffalo Literary Center played host to Mohsin Hamid, the first author in the 2018-2019 BABEL speaker series lineup. Arriving in Buffalo, Hamid said, felt in a way like coming home. Upon taking the stage he made note of the parallels between Buffalo and his native Lahore, cities whose best days are thought to be behind them and yet suddenly seem to have more to look forward to than others proclaimed. From the beginning, Hamid established himself as a “familiar stranger”, and the rest of his talk he spent telling that we all share that identity. For almost two hours, Hamid engaged the audience with anecdotes of his own personal history, the rationale behind the use of portals in his novel, the portals we use in real life, and the commitment to the use of imagination in adult life. There are several ways in which Exit West can be construed and analyzed as a piece of fiction, but Hamid clarifies this is a story about first love. It’s important to make the distinction: first love, because by definition, there must be a second or third. Otherwise, it would just be called love. Hamid’s own life served as a lens through which to write the novel, having roots in Pakistan, California and Princeton throughout his early childhood and young adulthood. It was a jarring experience at times, according to Hamid, which left him moments of insecurity. He shared with the audience that as a young child he did not utter a word for an entire month. After arriving in California and hearing another young child asked: “Why does he speak like that?”, terrifying his parents. Thankfully, for his family, and for us, Hamid spoke again. By the end of that month he was speaking complete English sentences, and found a voice in his silence. Yet despite this victory, language itself was a journey for Hamid. Upon his return to Pakistan as a nine-year-old he realized his fluency in Urdu suffered through his adoption of English. Once again his authenticity as someone who “belonged” was questioned. Hamid came off as a cultural enigma to some, a hybrid of language and places that were difficult, if not impossible, to separate. Yet feeling out of place was not an experience that was unique to him, he realized, and for that, there must be a good reason. Hamid argued that the sensation of strangeness, of being estranged from oneself and one’s surroundings, is universal. It is a bridge between the experiences of those forced from their native lands and those who have lived in the same house their entire lives. We are all migrants through time. Time challenges our sense of familiarity, because if you wait long enough, everything changes. The most striking parts of the journey are not the capsizing of a boat, or the strategizing of the crossing of a border. Those parts are small fragments of a larger transition. Exit West is not an exposé, or a front page article –it is a novel. What unravels in a story about first love is the story of two people: Nadia and Saeed. When asked how he came up with the characters, Hamid admitted they are a vicarious vehicle. Nadia and Saeed are simply people he could be, fragments of Hamid’s adult imagination. To illustrate how elaborate imagination can be, he broke down a daily scenario in his own life. Everyday around 2 p.m. his young son arrives home from school, and almost immediately there is a loud bang on his door. His son peeks his head around as he opens the door, then scans the room wide-eyed. The legs of a four year old become heavy, as he drags them up and stomps them down. The little boy roars. Hamid believes his son must also see him, in that moment, as some sort of ancient creature, another dinosaur, except hunched over a computer typing vigilantly. His son’s commitment to daily imagination astounds him, but also made note of the fact that almost all of us played make believe as children. So why do we stop? How do we end things well?